Energetic, joyful, dance along music and impeccable showmanship comes to Kirton Lindsey this Saturday (October 21) as Hope&Social take to the stage at the Town Hall. 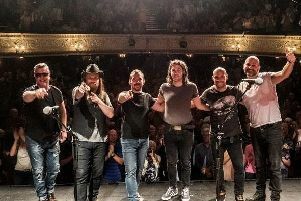 The Yorkshire band likes to involve their audiences in as many ways as possible, from singing on records, appearing in videos and making shows life affirming experiences. Hope&Social are Simon Wainwright, Simon Fletcher, James Hamilton, Richard Huxley, Gary Stewart, Ed Waring and Tom L’Anson, who between them play guitar, keyboards, drums, trumpet, trombones and superb vocals. During their eight years together they have recorded five albums and played hundreds of concerts and numerous festivals. Support on the night comes from Hull-based Katie Spencer.